Our dear Maxie has begun her journey North of the Rainbow Bridge. 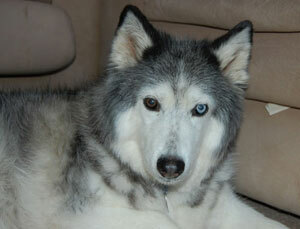 When Maxie first joined MaPaw 2 years ago, she had been diagnosed with a tumor on her liver. This petite girl made friends with everyone she met. Recently, she had begun to slow down and she seemed very tired. Surrounded by love and showered with tears, Maxie passed peacefully and quickly. Darling Maxie ~ know that you left behind many hurting hearts and that you will be horribly missed. Wear your silver harness proudly as you dance among the stars. Candles are lit and many are waiting to welcome you. Maxie is a petite fifteen-year old Siberian who makes instant friends with everyone she meets. Sadly, Maxie found her way into our rescue after being abandoned in a foreclosed and vacant house. Thank goodness, a Good Samaritan called the Animal Abuse Hotline and Maxie was saved. Maxie is a timeless beauty who is enjoying every minute of her golden years. Her favorite past times are going for rides in the car, slow walks around the neighborhood and just being part of her foster family where she can cuddle on the couch. We were sad to learn during a vet exam that Maxie has a mass on her liver which is in all probability cancerous. Due to her advanced age we have agreed with our vet that the kindest action is to not put our sweet girl through invasive testing that would not have any bearing on her quality of life. Maxie continues to be happy and comfortable ~ and loved ~ in her foster home and we hope she will remain so for quite some time.